UCINET is constantly being updated. Any registered user can download the latest version anytime by simply clicking the download button above. No new registration is needed, and no user data will be overwritten. Fixed bug in Networks|Triad Census producing "Abstract Error" error message. Changed default column widths in outputs from -1 to 0, which means "auto"
Changed Tools|Similarities routine so that choosing AVG Cross Products gets you just that, rather than the projected cross products you would have gotten if you hadn't had any missing data (i.e., avg cross products multipled by N). Made changes in Display function attached to the D icon on the main toolbar, in hopes of fixing problem with Windows XP machines which was resulting in a 'division by 0' error. Fixed bug in Networks|Extras|PLI causing it to fail to produce output. Fixed bug in Tools|Clustering|Cluster Adequacy. When multiple partitions were entered, the cluster sizes were being reported incorrectly for all but the first partition. Same program, but updated installation package. Hope to solve this spate of “The procedure entry point wcsncpy_s could not be located in the dynamic link library msvcrt.dll” errors. re-uploaded current version to see if that cures installation problem. Changed Networks|Egonets|Longitudinal|Brokerage Elasticity routine to add additional measures, namely the number of holes at T1 and T2, and these same figures expressed as a percentage of the possible, given the number of ties in the ego net at each time point. Fixed bug in Networks|Centrality|Hubs and Authorities routine. Was sometimes returning the singular vectors associated with singular values other than largest. Fixed bug in Networks|Regions|Components|Simple which was saving a components-by-actors matrix instead of an actors-by-components matrix. Fixed major bug in Networks|Ego Networks|Longitudinal|Brokerage elasticity that was causing nonsense answers. Changed Data|Export|Excel to permit export of large datasets (previously, due to limitations in Excel, the program was limited to 255 columns. now that Excel can handle more columns, this restriction has been lifted. Note: for large datasets, this function is better than cut-and-paste from UCINET spreadsheet. Bug fixed in Transform|Block which was causing the program to exit without producing output. Part of the Great Bug of 258. Fixed bug in Data|Display which was causing first row/col of a matrix to be repeated when user specified a range, such as "1 to 6"
Fixed bug in Data|Import text file|Multiple dl files that was causing crashes. Part of the Great ... oh never mind. Bug fixed in Transform|Matrix Ops|Within|Aggregations that was causing crashes. Part of the Great Bug of 258. More fixing of the Great Bug of 6.258. This fix should eliminate the "Strange error ... " message that was popping up. More fixing of the Great Bug of 6.258. Should eliminate crashes in multiple centrlaity measures (old), closeness centrlaity, Bernoulli randoms, and more. Fixed bug from 6.258 causing crashes when user tried to open a non-existent file. Fixed bug in Networks|Triad Census causing problems with undirected graphs. Added ability to re-run most recent command by pressing Alt-Backspace. You can also select from a list of recent commands, stored in a drop-down list on the menu bar. Note: not all commands can be re-run yet. Added new routine for decomposing a node's "total centrality" into its direct or "endogenous" contribution, and its indirect or "exogenous" contribution. Fixed bug in Networks|Centrality|Fragmentation. Was not doing any calculations unless you explicitly set the method -- i.e., was ignoring the default setting. Replaced old group centrality routines with one that will eventually be more general. Fixed bug in Networks|Centrality|Multiple Measures that was causing intermittent crashs. Fixed important bug in new routine Networks|Cohesion|K-local bridges. Was giving wrong answers. Oy. Fixed internal bug in a data structure, causing intermittent failures. Note: observed similar bug in Networks|Centrality|Multiple measures (new). This has not been fixed yet. Added new 2-mode routine for calculating basic cohesion measures. Fixed important bug in creating multi-relational files. E.g., when dichotomizing a multirelational dataset like Sampson, a new multirelational dataset is created. Added standard errors of coefficients for the double-dekker qap regression program. Fixed major bug (probably introduced in version 6.232) which was causing most procedures to read files containing multiple matrices to screw up and just read the first matrix. Added new function to spreadsheet editor. Under "file" in the spreadsheet menu, there is an entry called "insert columns from file". This lets you read in a new dataset and join it to the dataset you already looking at. This is handy for continually adding new variables to a dataset, say, one called "attribs". Added Markov Clustering algorithm to Networks|Subgroups. I was skeptical but it works really well. Does a great job of telling you how many clusters there are. Replaced Tools|Scaling|Eigenvectors routine with a new one. The old would only produce first eigenvector. The new produces all, and handles non-symmetric matrices (which may result in complex eigenvalues and vectors). Added Networks|Egonets|Change routine. Given network at two time periods (stored in a single dataset with two matrices), it counts number of ties gained, lost, kept etc. and records whether contacts in each of these categories had ties with the alters in the T1 ego network. Fixed GINV to not require square matrices. Fixed bug in Networks|Egonets|Honest Broker|Longitudinal so that both output matrices are now being saved. Added experimental power routine to Networks|Centrality|LBK power. Program will now ask for User id. If you don't have one, just enter your name. Fixed bug in Networks|Egonets|Structural Holes which was causing the calculation of ego-betweenness to blow up. Changed the way browse buttons deliver filename. Now, if the file's filepath matches the current folder, the program presents only the filename. But if the user had browsed away from current folder, then it retains full pathname. Fixed bug in Options|Helper Applications, preventing retention of the setting for the text editor across ucinet sessions. Fixed bug in Visualization menu that prevented Mage and Pajek from running. Added new routine Data|Extract|Subgraph Via Attribute Vector. This provides a convenient way to extract a sub-network based on a node property, such gender = 1, or betweenness > 0. Fixed bug in networks|ego networks|structural holes procedure which was sometimes causing it to refuse to run. Fixed important bug in the Data|Import via spreadsheet|DL type formats procedure. It had been ignoring the "force symmetry" option. No longer. Fixed bug in Networks|Ego Networks|Structural Holes // Restricted Model procedure. It was giving a floating point error for egos with only one alter. Fixed bug in Data|Import Excel|Multiple DL which was giving errors when inputting edgelist data with only 2 columns. Replaced textual output (logfile) browser with user's preferred text editor (which defaults to the Windows Notepad). Added new data import procedure Data|Import Excel|Multiple DL type formats. It allows you to import Excel files that are formatted as nodelists, edgelists, etc. You can also simply cut and paste or enter data directly into a spreadsheet. Changed DATA|JOIN procedure to allow resizing window and to remove distracting ".##h" from file names. ALT-Backspace key now sends you to the last run routine. At least, most of the time. Fixed bug in Networks|Centrality|Closeness in the reversed distances (Valente & Foreman) routine which was giving incorrect group centralization scores. Fixed bug in Networks|Cohesion|Density|Density by Attributes which was not allowing choosing different attributes. Fixed bug in Networks|Cohesion|Density|Overall Density which did not have browse buttons implemented. Fixed bug in Transform|Union, which was allowing long filenames to wrap, causing the program to misunderstand filenames. Finished changes to Networks|Cohesion|Krackhardt GTD routine so that all measures are appropriate for disconnected graphs. Added routines under Data for matching datasets via node labels. For example, if you have a network dataset and a corresponding attribute dataset, but the rows of the attribute dataset are in a different order than the rows/columns of the network dataset, you can run either Data|Match Network and Attributes or Data|Match Multiple Datasets to sort them both in the same order. This works in Vista as well. Changed help viewer to html-based viewer that works with Vista. Changed algorithm used to calculate eigenvalue in the GETBETA function of Networks|Centrality|Power procedure. The old algorithm failed when a matrix had multiple eigenvalues with the same absolute value. The new algorithm always works. Fixed bug in Networks|Regions|K-core routine which was giving wrong values for coreness (it was delivering 1+ the correct value in most cases). Added feature to Networks|Egonet|Structural Holes to enable defining ego network according to incoming, outgoing or both kinds of ties. Also fixed bug causing Efficiency scores to not be missing values when degree was zero. Changed Networks|Egonets|Egonet Strength to allow defining ego network in terms of outgoing ties only, incoming ties only, both outgoing and incoming, and reciprocated ties only. Added new procedure Networks|Egonets|Egonet Strength. It calculates the average attribute value of each ego's alters. For example, you can calculate the average centrality of each person's neighbors. Fixed bug in "count combinations" procedure which was causing output file to overwrite input file. Added TIME STACK procedure to Transform menu. This procedure takes a collection of separate datasets with nodes in common (such as a network sampled at multiple points in time in which nodes appear and disappear), builds a single multidimensional matrix with all nodes that have ever appeared. This would run geodesic distances on each relation in the Sampson dataset, and place the results in a dataset called "distmat". New installation program for UCINET. With this version of UCINET, the directory locations for UCINET and other Analytic Technologies programs have changed. The new locations are a bit more rational. However, there is a down side, which is that if you want this new version to replace your old one, you must uninstall the old one first. If you don’t uninstall the old one, you will end up with two versions of UCINET, and any shortcuts you may have created will call up the old version rather than the new. So, we recommend uninstalling the old version before installing this one. Fixed bug in Data|Subgraphs from Partitions. The automatically generated default output filename prefix was wrong -- it included a file extension and shouldn't have. Fixed recently introduced bug in Random Graphs|Erdos Renyi that was placing all ties in upper left quadrant of network. Modified installation program. More modifications to come. This may result in the program not being able to find NetDraw. If this happens, go to Options|Helper Applications and select Netdraw entry. Use browse button to find the netdraw program. It is probably located here: c:\program files\analytic technologies\netdraw. ONce you find the folder, just click on netdraw.exe and from then on UCINET should be able to find it again. Fixed bug in Qap Regression interface that was preventing choosing multiple independent variables, one after another. Changed options in hierarchical clustering to include two kinds of average link clustering -- one that is weighted by cluster size and one that is not. Fixed bug in the weighted average clustering. It had been weighting by the new size of the cluster (after merging) when it should have weighted by the old size. Fixed bug in Data|Attribute that created a default output dataset name that was not sensible. Changed Transform|Block and Networks|Cohesion|Density to accept "Identity" as a response to a prompt asking for row or column partition. This makes it convenient to calculate things like the number of ties that each node has to women and (separately) to men. Fixed bug in Data|egonet procedure, which was failing to save the ego net on disk (instead, it was saving the whole network). Fixed bug in handling of filenames with spaces in them. Was causing two sets of full quotes to put around filenames. Fixed bug in Data|Join procedure creating output datasets with thousands of matrices. Fixed bug in Networks|Regions|Components|Valued which caused incorrect dendrogram when a solution resulted in the identity partition (where each node is in a class by itself). However, the saved HIPART matrix was always correct. A few changes to dialogs in order to encapsulate filenames in full quotes. Added new QAP Correlation routine to the main menu. Missing values are handled differently with respect to significance (p-values) and standard errors. In the old qap routine, the significance was based on Hubert's Gamma, which gives identical significances as correlation in the case of no missing values, but gives different values when missing values are present. Another advantage of the new routine is that it accepts more than two input matrices (and computes correlations among all possible pairs). Fixed Permute function. When permuting order of matrices in a dataset, it was ignoring permutations of the rows and columns. Added routine to matrix algebra to intersect graphs. Syntax is: <outdataset> = INTERSECT(<indataset1> <indataset2> ....). For example: Y = INTERSECT(TIME1 TIME2 TIME3). The input is a set of networks. The output is a single dataset with multiple relations. The nodes are just those nodes that are found in all of the input datasets. Changed installation package. Thanks to Rich DeJordy, I think we have finally ironed out issues with upgrading to a new version so that you do NOT need to uninstall the old version (what a pain!). 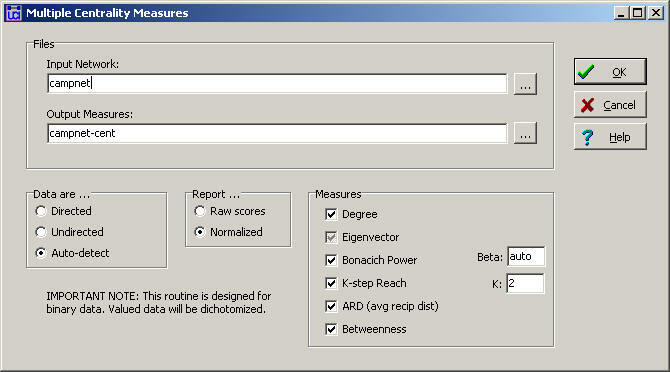 Changed method of scaling factor analysis scores to match SPSS. Also corrected a minor bug in their calculation. Fixed problem in cohesion|reciprocity routine that caused crashes when using a partition. Fixed bug in export to Pajek that caused crashes when not all fields where filled in. Installation package now allows upgrades as well as new installations. Fixed Non-metric MDS routine when using Metric starting configuration. Thanks to Rich DeJordy for pointing this out. QAP regression updated to reflect the latest method by Dekker, Krackhardt and Snijders. It is called "double-Dekker semi-partialling". Fixed bug in E-I index procedure. In printing output from permutations, the values for internal and external ties were swapped. This was only a printing problem and did not affect the calculation of significance. Thanks to "analysisrussell" for pointing this out. Some routines modified so that browsing for files automatically puts full quotes around the file name in dialogue windows. Without the full quotes, routines that expect input in the form of filename-space-dimension-space-integer get confused if the filename contains spaces. So if you put quotes around the filename, the program knows it is all one object. IMPORTANT NOTE: if you type the filename in yourself, the program will not automatically supply quotes. New installer implemented. Before downloading this version, you should uninstall the old version by using the Windows uninstaller (go to start|control panel|add/remove programs). Datafiles will not be removed by the uninstall. The new version handles multiple users of the same machine better, through making better choices of where to put things in the Windows registry. However, installation does require having administrator rights. Ok, this time I actually did change the default value of DisplayFullPathNames to True. In Jan 2005 degree centralization calculation was modified to yield values between 0 and 1 for valued data. Now (thanks to prodding by Giancarlo Oriani), I've extended the same change to the normalized degree centrality values. So all of these are just their old values divided by the largest edge value in the network. Fixed bug in structural holes dialog window in which it would only calculate full network constraint if the user specifically chose full network option. Otherwise it was calculating ego network constraint even if the dialogue window showed "full network". However, all outputs were always correctly labeled. Changed default value of DISPLAYFULLPATHNAMES option to true. This allows ucinet to easily navigate to different folders without getting confused. Fixed bug in Data|Remove Pendants which caused a crash when removing pendants removed all nodes in the network. Also hooked up the browse buttons. Reorganized Networks menu. Still changing. Fixed bug in Degree Centrality (asymmetric model) which was scrambling the labels when writing out to file. Fixed bug in hierarchical clustering (introduced yesterday) which caused crashes. UNION. Added option to allow adding up ties that are in common across two networks that share some nodes. So if network A has a tie between Billy and Johnny, and network B also shows a tie between Billy and Johnny, the new network will have a 2 for the relationship between Billy and Johnny. Fixed bug in spreadsheet -- previously, if you clicked on main window while in the spreadsheet, it reset the spreadsheet (clearing all cells). Added row and column indicator to spreadsheet. It can also be used to go to a particular cell. Fixed bug in data|export|excel that caused problems exporting datasets with multiple relations to excel on some systems. Changed dichotomize function to output real-valued matrices (to accommodate missing values). Fixed bug in ucinet system file reader -- it affected newer procedures that were trying to read interger-type files created by equally new procedures (such as Erdos-Renyi graphs). Fixed bug in Random|Erdos-Renyi procedure. When user selected multiple graphs, the program was constructing them cumulatively so that the density increased with each graph. Now they are separate and the density is identical for all graphs created. Fixed bug in Krackhardt GTD routine. Previously, it was failing to output measures to a disk file. Added measures of clustering adequacy to Tools|Cluster|Cluster Adequacy. Used to judge whether a partition does a good job. Modified Import|VNA procedure to be more forgiving of errors in the data. Small but important bug in Tools|Similarities leading to slight inaccuracy in calculation of similarities between matrices has been fixed. Fixed bug in 'Subgraph from Partitions' which caused problems with 0/1 partitions. Added info to About box so you can tell whether a copy is registered or not. Added ability to import VNA files (Data|Import|VNA). Only imports network and node attribute data -- node and tie properties are ignored. Fixed bug in hierarchical clustering which was preventing it from saving cluster id variable. Also renamed the cluster id dataset from "tabuclus" to "clusterid"
Changed starting cutoff value in dialogue box for "subgraphs from partitions" routine to 1 (was 3). Modified UNION procedure to allow option of putting missing values (instead of zeros) for the links between graphs. Also modified the way it handles node labels when "match by labels" is not selected. Completed addition of default output folder -- now all routines except one's that don't make sense for it should send outputs to the designated output folder. Added default output folder -- if non-blank, most routines will now direct output to that folder. Fixed bug in EdgeArray1 data reader (thanks to Kate Lawrence for pointing it out). The problem was that for data with labels embedded and alpha=yes (the default) the program sorting rows and columns of the data matrix in alphabetical order, but not actually changing the labels, so the wrong labels were attached to each node. Fixed major bug introduced in version 6.44 (April 9th, 2004). The import procedure was incorrectly reading dl files using fullmatrix format in which row labels were not embedded. Added facility for creating new networks (or matrices in general) based on boolean combinations of old ones. E.g., create matrix Y so that Yij = 2 if Xij > 0 and Zij = 34, and Yij = 1 otherwise. It is under Transform|Matrix operations|between datasets|boolean combinations. Fixed bug in IMPORT DL procedures causing first letter of row/column labels to be cut off when reading files using Fullmatrix format. Hierarchical clustering now runs on each matrix in a 3-way dataset. Also includes some additional diagnostic output. Metric MDS changed to accept datasets with multiple matrices -- it automaticaly does a scaling on each matrix in the dataset. Changed Tools|Dissimilarities procedure to enable multiple relations and to permit computation of distances between relations. Also added Hamming distance measure. Union procedure added to the Transform menu. Use UNION to combine separate graphs into one larger graph -- taking the union of all nodes and lines. Added Remove Isolates procedure to Data menu. Provides one-step way to generate network with isolates removed. Added new output to Brokerage routine that shows, for each actor, who they are brokering between. Added additional QAP regression methods, including Dekker, Krackhardt and Snijders k-step semi-partialling method which is very slow but very accurate. For my money, though the fast ordinary semi-partialling is best choice because it is way faster and its only fault is being too conservative (doesn't reach significance often enough). But I'm sure Dekker, Krackhardt and Snijders would consider this a very irresponsible thing to say. Added multiple dl import routine to handle reading many files at once. Non-metric mds routine has been changed to run on all layers of a multi-matrix dataset. Also, the bug that prevented running on matrices greater than 255 rows or columns has been fixed. Replaced the spreadsheet with a new one that is not limited to 255 columns. It can also do some limited transformations of the data. Changed the output.log browser so that seeing large output takes less time. For example, running Data|Display on large datasets used to take forever. It is a bit faster now. Changed input format for Recode procedure to facilitate more complicated recoding procedures. Adopted new installation procedure that is a little faster, a little simpler. Keyplayer is no longer included with UCINET installation. Changed output of geodesic distance procedure to suppress screen output for large datasets. Now processes a 5000 node dataset in 2 minutes. Fixed bug in UCINET versions 6.04 discovered by Melissa A. Schilling in which degree centrality saves a centrality dataset that has the wrong labels. The numbers are right, and are in the original order, but the labels for the nodes are in the wrong order. Added BETA TEST version of new partialling approach to QAP regression. Seems to work fast and well. Updated the version of KeyPlayer that is automatically installed with UCINET. Apparently, old version was missing a file. Changed default on line betweenness routine to not do Newman-Girvan hierarchical clustering automatically. See also changes in NetDraw. F-Group procedure from UCINET 4 reinstated. No documentation as yet. Changed maximum flow & lambda set procedures to accommodate networks with more than 255 nodes. Now there is no limit. nodelist and edgelist readers changed to allow names enclosed in quotes as in "John Smith" or "Smith, John Jr."
More recent version of Netdraw added that allows text attributes (e.g., gender can have values of "male" and "female" and "not clear"). More speed improvement on reading nodelist and edgelist files. Group centrality|Degree|Test routine fixed (was giving crazy answers and hanging up). Fast routines for reading nodelist and edgelist data files reinstated. Button added to Data|Egonet routine that allows selection of the focal nodes by choosing node names from list. The Tools|Dissimilarities procedure was fixed. It had been ignoring one cell in all computations, resulting a dissimilarity score that was only approximate. Thanks to Jim Moody for pointing this out. Expected values from the continuous core/periphery routine have been fixed -- Previously, the rows and columns had been sorted according to coreness, but the row and column labels were not changed, resulting in incomprehensible numbers. Now, the matrix is presented unsorted. Netdraw graph drawing routine added. All routines that used to output a partition-by-actor vector or matrix now output an actor-by-partition matrix. This way, what are normally considered variables are always columns. Help files updated to include new procedures. NOTE: Netdraw still has no documentation. It's coming. Edge Betweenness program fixed to eliminate the "can't open scratch file" error. Now able to launch both Mage and Pajek programs from within UCINET. Improved method of separating core from periphery when using the continuous core/periphery model, along with improved concentration measure. Fixed bug in Attribute procedure which lost the labels of nodes. Includes new routine for exporting to the METIS program, which can cluster graphs with millions of nodes extremely quickly. Also includes a much faster betweenness centrality routine (relative to the one in versions 5.64 and earlier), using Ulrik Brandes' algorithm. Includes slightly improved routine for point-connectivity (# of node-independent paths between pairs of points). It is still very slow, though. Fixes bug in DESCRIBE that prevented imported labels from being saved. Adds betweenness decomposition routine which iteratively removes nodes with zero betweenness, yielding a core group of nodes that are mutually interdependent. Edge betweenness routine, ala Anthonisse has been added. Even newer version of betweenness implemented, using Ulrik Brandes' (Ulrik.Brandes@uni-konstanz.de) algorithm. It works with both symmetric and non-symmetric data. Bug fixed in MRQAP causing near infinite standardized coefficient when there were more than 32767 ordered pairs of nodes. Import>RAW routine improved to guess the number of rows and columns better when the entire dataset is in one row. Even newer version of betweenness implemented, using Ulrik Brandes' (Ulrik.Brandes@uni-konstanz.de) algorithm. It works with both symmetric and non-symmetric data. Mage export routine now allows you to skip the adjacency matrix and just input coordinates. New version of betweenness implemented that typically runs around 3 times faster for typical graphs of about 1000 nodes. Algorithm courtesy of Mark Newman (mark@santafe.edu). However, it only runs on symmetric data (undirected graphs). Bonacich Power routine modified to allow non-symmetric data. Right eigenvector routine added to matrix algebra procedure. To use, type REIGEN <filename>. Note this routine uses the power method and will only converge on a subset of matrices. Instability in the mrqap regression routine was eliminated. Again. Bug fixed in SORT: it wouldn't recognize lower case letters in the dimension prompt of the dialog box. Instability in the qap regression routine was eliminated. 5.51 6 Dec 2000 Two major bugs fixed in this version. There was an error in the egonet>density routine in some versions of 5.4 (I think earlier versions are fine), producing random numbers instead of the calculated values. There was a bug in the REGE routine so that all data containing decimal places were truncated. Numbers less than one but greater than zero were converted to 1s, and numbers greater than 1 were rounded to nearest integer. This bug goes back many years. In addition, a new routine was added in the statistics menu, enabling users with krackhardt-style css data to test for significant differences in different aggregations of the data (for example, comparing the aggregate female matrix with the aggregate male matrix). No documentation is available yet. Several minor fixes, including the default output name of the dichotomize procedure. This version fixes a major design error in the density or anova-based categorical autocorrelation routine. In previous incarnations, the routine calculated r-square correctly, but the significance test was biased, yielding significance too often. The routine has been completely replaced and now calculates significance correctly. In addition, it gives additional informative output. Adds Gould and Fernandez brokerage measures. Send mail to info@analytictech.com with questions or comments about this web site.